Return Policy: Returns accepted up to 10 months This product contains software or Internet access code(s). Returns are not accepted if seal is broken or if access code revealed. 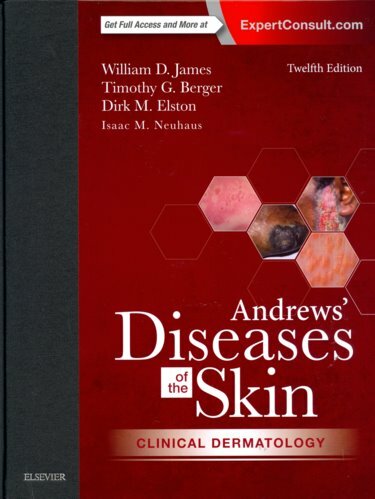 Abstract: Effectively diagnose and treat a wide range of skin conditions with the latest edition of the highly regarded Andrews' Diseases of the Skin: Clinical Dermatology. The 12th edition of this classic reference, by esteemed authors William D. James, MD, Timothy G. Berger, MD, and Dirk M. Elston, MD, provides state-of-the-art information on newly recognized diseases, new conditions, and unusual variants of well-known diseases, as well as new uses for tried-and-true medications and unique drugs for diseases as disparate as melanoma and rosacea. It's your ideal go-to resource for clinical dermatology, at every stage of your career.